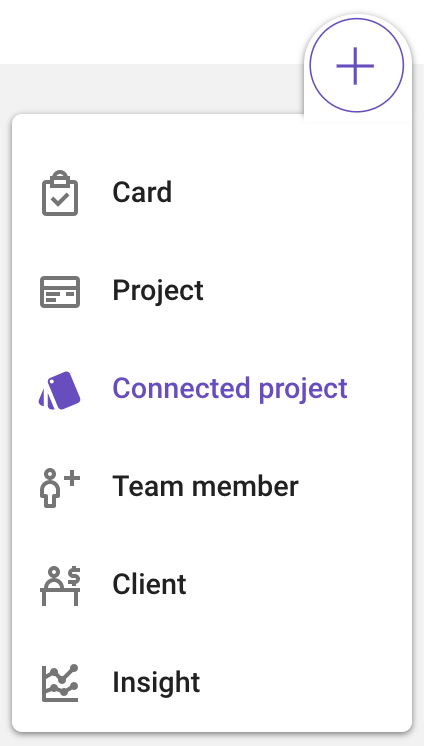 Connecting two or more projects is a great way to gather all information, cards, teams, and sprints into one single view. Bringing people and workflows together, and easing collaboration. Connected Sprint planning lets you plan your roadmap with a more holistic perspective. Prioritize cards across projects, and plan your Sprints to fit together across departments, e.g. for a major release. Step 2: Name the connected project, and select the projects you wish to connect. The connected project has been created. It will show up in a unified box under Projects. Various tabs are available in the sidebar similarly to a regular project. Connected Projects lets you view and manage the Workflow across all the connected projects. Manage the team, do the sprint planning, and move cards around in the Workflow. A great tool and timesaver when dealing with more complicated projects. Remember, all changes made inside your connected project will affect all the connected projects. This also means that certain parts of Project Settings will be dictated by the Connected Project, and thus not editable inside the individual project.